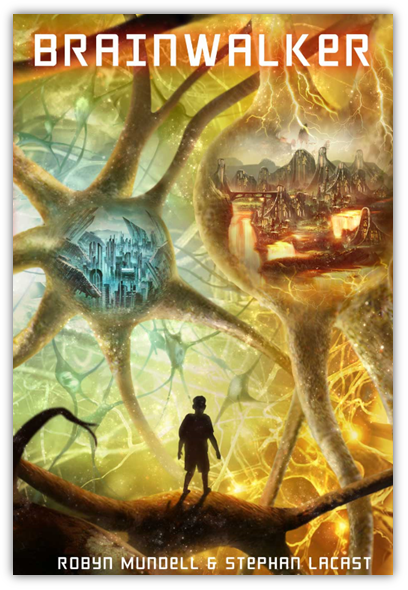 Q: How did you get the inspiration for YA/Middle-grade novel Brainwalker? Robyn: I have always been cursed with an overactive dream life. Every night I am bombarded with dreams which I can recall the next day with disturbing precision. I often wish that I could turn off the “dream switch” and just get a good night’s sleep. Until one night, I had a dream I could not ignore… it was about a boy who found himself inside his father’s brain. Stephan: I, on the other hand, have always struggled to remember my dreams. All I can do is daydream. One morning, while daydreaming about Robyn’s nighttime dream, I had a vision…a mysterious civilization of intelligent beings, living inside a human brain. At the time Robyn had her dream, we were brainstorming on a pilot she was working on for FX called N.I.M.B.Y. (Not In My Backyard), about a group of mentally ill people trying to integrate in a normal neighborhood. We were reading R.D. Laing’s The Divided Self, Oliver Sacks, Carl Jung and others, and exploring other projects with the brain theme. So Robyn’s dream came as a timely synchronicity. We began to imagine all the possibilities of a boy going inside his father’s brain,and thought it would make a great story. Q: Is your hero Bernard based on anybody? Robyn:I’m sure we both would tell you that we’re Bernard. I was very rebellious. I was a mooner. When I was three I was obsessed with the movie The Red Balloon and when it didn’t play, I took a broom and charged the screen. I guess you could say I had impulse control problems. I had scores of ideas that I wasn’t good at focusing and so I would frustrate people. Even though the notion of being righ-brained dominant has been dismissed, there are people who are wired like myself (and we know who we are) who have all these creative ideas but are not good at communicating them in a focused way, so it can be frustrating. I used to feel that teachers hated me, like Ms. Needleman hates Bernard. I felt they were impatient with me and that I chemically rubbed them the wrong way. Stephan: I didn’t feel encouraged to pursue my creative impulses as a child. So I built a sense of limitation, while taking refuge in a hidden world of day dreaming, in which everything was possible. I particularly relate a lot to Bernard’s loneliness, his interest in the unknown part of science and our universe, and his desire to make important discoveries and explore new worlds. Q: At the heart of the novel Brainwalker are a father and a son who feel disconnected from each other. Bernard thinks his imagination isn’t respected, and that his father doesn’t take his ideas seriously. How much of that is personal? Robyn: Stephan and I have different relationships with our fathers, and in the book Bernard and his father Floyd are an alchemy of this. Stephan’s father was a judge and he wasn’t exactly encouraged to think out of the box. So that’s what he had to break out of. My father is a genius type, a Nobel laureate, so I was definitely desperate like Bernard to prove that I was as smart as he was, and had something valuable to contribute. Stephan: Yes, with her father it’s how much can you achieve? How far can you go? With my father it was more the opposite. Find a comfort zone and don’t step out of it. Think of all the things that could go wrong if you do. We’ve been exposed to each other’s dynamics and Bernard’s really a hybrid of the two.That being said, this is not about blaming your parents. They do the best they can. This is about realizing your brain is what you make it, and that you have the ability to change and grow. Q: Bernard’s father Floyd is a scientist who’s in trouble at his job because he’s stuck creatively. Can you explain how what’s happening in the Brainiverse mirrors what’s going on in his life? Stephan: in the novel Floyd can’t get a new idea, because the right side of his brain is deprived of energeia, which is mental energy. He’s also pretty disconnected emotionally from his son for the same reason. And this is what Bernard is going to try to change, in his clumsy, kid-like way. Robyn: Floyd’s fear of change, of emotion, of the unknown, creates dangerous stagnation in his life. This is reflected in what the Reezon Holons are doing to the Holons from Intuit. Basically, the left side of Floyd’s brain, which is already dominant, is doing everything to suppress the right side’s ability to function. This is a metaphor for how difficult it is to change habits and wiring in the brain. Q: How much of Brainwalker is science? Stephan:We tried to map our ideas to current research in neuroscience, as long as it wouldn’t be too constraining for a story. For example, the decision centers in the brain are usually thought as being in the frontal lobes. So this is where Reezon and Intuit are, even though it’s of course a lot more complex. We also looked at various theories about brain lateralization, how that’s evolved over the years, as well as theories about intelligence and the role of emotions in our thinking.There’s amazing work being done in these areas, partly because of recent imaging technologies. It’s given scientists access to the brain, and the mind, like never before. Q: What discoveries in neuroscience have influenced the story of Brainwalker? Stephan: Two of the most important discoveries of the last few decades were neuroplasticity (the ability of the brain to rewire itself, for example after an accident) and adult neurogenesis (the ability of new nerve cells to grow even in adults).That influenced us a lot. Before I got really interested in studying the brain, my strongest memory of it was to be told at 13, by a teacher no less, that past the age of 15 we start losing neurons and it’s all downhill from there. Robyn:But it turns out it’s not true. And this was only proved wrong in the mid 90’s..
Stephan:The sad thing is that some neuroscientists had known for decades that it wasn’t true, but for the longest time they were ridiculed by mainstream neuroscience. The dogma was that the adult brain couldn’t grow new neurons. In a way, it’s like saying that up until 10-15 years ago, most neuroscientists thought the Earth was flat. I don’t think people realize what a huge paradigm shift this is. What’s your horizon going to be if you think the Earth is flat? What kind of outlook on life are you going to have if you believe that an adult brain – your brain – cannot grow new nerve cells, and is just going to decline? Robyn: It’s all about using it. Learning new things can help brain cells grow at any age. Q:It seems that beyond neuroscience, the novel Brainwalker also touches on psychology and philosophy. Stephan: The field of neuroscience has evolved tremendously over the last few decades, and the progress made is fascinating. At the same time the brain, the mind, and the relationship between the two, remain some of the biggest questions of science. Neuroscience is one of the most fascinating fields of scientific inquiry today,and we wanted to give children a taste of the brain as a great mystery, not as something science has conquered. In that spirit, it was important to include hard neuroscience but also more grey areas and even mystical themes. Robyn: This is why our research brought us to a lot of different thinkers. We immersed ourselves, not only in physical brain research, but also in books about mind, consciousness, and even quantum physics. For example we were interested in the physicist David Bohm, who started out with his own interpretation of Quantum Theory , and later went on to try to bridge science and consciousness with the indian philosopher Krishnamurti. Another example is the Karl Pribram. He theorized that thoughts might be encoded in the brain in the form of holograms. His ideas have been mostly discarded by conventional neuroscience, but that’s partly why we liked it. Carl Jung was also an important influence. We were inspired by Jung’s idea of a collective unconscious, the idea that something connects us all and influences us, which we’re not aware of. That’s where our Telamons characters come from. Q: Why do you think it’s important for children to learn about the brain? Stephan: because they all have one,and what they can do with it is unique. It’s like having an infinite galaxy of cells at your disposal. What are you going to do with your galaxy? What children do with it is bound to affect their life more than anything else. Our fantastic world takes plenty of liberty with the actual science, but it’s mainly to stimulate children’s imagination, and get them interested in finding out how their brain really works. Robyn: Educators are trying to teach more neuroscience concepts to kids. There’s a growing understanding that for kids to become more aware of the brain is vital, both throughout school, and later in life. There are more and more educational initiatives trying to achieve this and it’s definitely a good thing. Q: The notion of striving to change, and developing your creative side and your imagination, is a big theme in your novel. Why do you think it’s so important? Stephan: Your ability to make new connections and form new synapses in your brain is key to getting new thoughts and ideas. Often the best ideas come from completely non linear and seemingly illogical connections. Koestler called this process bisociation, the association of ideas from unrelated domains. It’s important in art, science and business. If you want to get a breakthrough of some kind,you have to nurture your imagination, your ability to see new connections, new ways of looking at things. Robyn: Even though we made the “left side of the brain” the bad guy, we know the logical part is vital. It represents important characteristics that we all share to varying degrees. In my own attempts to make my life more functional, when I challenge myself to be more logical instead of my usual emotional response, I’ve had incredibly positive results. But on the other hand, in the bigger picture, I think we both feel that we live in a world where creative and emotionally dominant people, those Tennessee Williams called the delicate people, are not encouraged enough, particularly in educational systems. That is what Sir Ken Robinson aptly points out. Q: What would you hope that kids will take away from reading the book Brainwalker? Stephan: I hope they become more aware of the way their brain works, and realize what an amazing tool they have. If they realize what their brain is capable of, and learn to think for themselves, they can achieve extraordinary things. Otherwise, their thinking will be conditioned by others, and their imagination and creativity will disappear in their adult life. Robyn: And also, don’t be afraid of change. Don’t be afraid of developing more of your Reezon side if you’re an Intuit, and more of your Intuit side if you’re a Reezon. Everyone can relate to this because we have dominant ways of thinking which are in conflict at times. The goal is to explore the civil brain war and use our brain in a more balanced and harmonious way. What drives a person’s desire to choose one activity over another? All human brains have an emotional and logical side. It’s a question of proportions. That’s why some are dancers and some are accountants. Q: Reezons and Intuits are fighting over Energeia. What exactly is Energeia? Is there anything in an actual brain that corresponds to energeia? Robyn: Energeia is mental energy. The two sides of the brain are fighting over Floyd’s mental energy. Right now the left side has most of it, and they’re dominant while the right side just gets the crumbs. Stephan: The flow of energeia depends a lot on how Bernard’s father focuses his mental energy. So with someone who is predominately left brained, more logical and rational, there would be more energeia on the left side of their brain. And someone who is right brained, more emotional and intuitive, would have more energeia on that side of their brain. Q:Energeia, the mental energy, looks like lava,and the Intuits forge it with their bare hands. Any reason for this? Stephan: It’s a combination of things. As a kid I visited a blacksmith’s workshop, and I was puzzled by the way he could take solid metal, melt it, shape it, and then make it solid again. This transformation felt like magic to me.Then as a teenager, I lived on a tiny island called Reunion, which is basically made of two volcanoes. So I got to see a few eruptions up close. It kind of came together when we read David Bohm and his description of creativity as a state of mental confusion, and crossed that with fire as a symbol of creativity in alchemy, and how painful being creative can be. Robyn: The question is: how long can you withstand the creative fire, the state of confusion? When your mind is in a state of confusion and chaos, the temptation is to revert to some kind of mechanical or linear solution, something you already know, and that’s already wired in your brain in a way, because confusion is painful. But if you’re able to withstand the pain and the state of confusion long enough, you can create something new. That’s what the Intuits of the right side do when they forge lava-energeia with their bare hands. If you want to forge energeia and create, you’re going to have to put your hands in it and get burned. It’s the only way to give shape to your creative energy. Q: In the Brainiverse, neurons are alive and human-like beings, the holons, live inside them. How did this come about? Stephan: From the very beginning, we wanted to give a sense that the brain, our brain, is alive.We didn’t want to personify neurons and give them eyes and a mouth, but nerve cells in the brain are living organisms, and to a degree, they’re conscious of their environment. They also form the basis of our consciousness. Robyn: We didn’t want the world of the brain to be literal. What’s been most challenging and interesting is to create a basis of reality and then allow our imagination to kick in. Because kids aren’t literal. The world had to be believable in a brain sense, but we didn’t want it to be The Fantastic Voyage with shrinking people. Stephan: The holons are a nonmaterial form of life in the brain. They live in parallel with the physical world. We wanted people to wonder, what if it could be true? Arthur Koestler coined the name holon. A Holon is basically that which, being whole in one context, is also part of a bigger whole in another context.It describes the inhabitants of the brain very well. They are “whole” in the universe of our mind, but at the same time they are “part” of a larger form of life: us. Q: Do you think the Brainiverse is real, do you think that there’s a world with people in our head? Robyn: Where else could life be, than in your own head? The Brainiverse is another dimension. So yes, it’s real. At some point we were told that since Bernard’s father was a scientist, everything needed to be “accurate”, which was kind of funny given our fantastic premise. Stephan: It wasn’t our goal to make everything scientifically true. The only thing that’s really one hundred percent accurate in the book is that there are people living in your brain. Q: What’s the relationship between the holons and us? Between their world and ours? Stephan: The Brainiverse is like a universe parallel to ours, except it’s not parallel. On the contrary, our universe and theirs are tightly entangled. But most Holons don’t know about us, just like we don’t know about them. So they don’t pull the strings, and they’re not our little helpers either. For them, what we do with our thoughts changes the currents of energeia or the way the neurons move, so it affects their environment. But it’s just like the weather. Q: Does what the holons do influence us? Do they control our thoughts? Robyn: We influence their world, but in a way, they influence us too. That’s not their goal, more like a side effect. And there’s an alchemy that happens as a result. If you don’t know why you think of something that might be because of the Holons. And when the Holons see neurons dying and wonder why, they have no idea it’s because of Floyd’s own thoughts, and because he shut down a part of himself inside his brain. Q: In the book, the Brainiverse is as big as a galaxy. How can something so small as the brain contain a galaxy? Stephan: There are billions of neurons, and trillions of synaptic connections in any given brain. For the holons,the Brainiverse appears infinite. Intuit and Reezon are a very small part of the whole brain, and they don’t know that they’re part of something else that’s even bigger, they don’t have the perspective. We don’t really know what our universe is part of, and for all we know we could be part of a single cell. Robyn: It’s a metaphor for the infinity of the mind’s potential, and the limitlessness of the imagination. Kids think expansively and we wanted them to see their mind as a reflection of that, something limitless, something with infinite potential. Q: The story of Brainwalker is about balance between the two sides of the brain, but Reezon, the rational and logical side, is the bad guy. Are you saying there’s something wrong with reason and logic? Robyn: Not in principle. We’re fully aware that one side of the brain without the other would not a good scene. There are people out there, and I relate to this, who feel that they’ve made a lot of mistakes from dwelling too much on their creative and emotional right side. Being logical and rational can really ground you, and help you take creative ideas and focus them so you can make them happen. Stephan: But you need both sides to be whole. Logic and reason have to go hand in hand with emotion, intuition, and creative freedom. It’s crucial in science as well. The most important discoveries are rarely made linearly, using logic and deductive reasoning. In fact they often break previous “logical” assumptions and force you into a new paradigm. Robyn:The problem is not the left brain, the problem is the fact that we let our brain become more and more static over time, and we lose our inspiration. Everything becomes hardwired, and it becomes increasingly impossible to break a habit, or change our behavior. Kids have a fantastic natural ability to imagine new things, see connections that no one else sees. We should do anything we can so they don’t lose that ability. And yet so much of what they’re taught is just rote. Q: Why are the Reezons afraid of energeia? Stephan: The Reezons are afraid of energeia’s unpredictable nature.They’re all about control.They only want to do something if they know in advance how it will turn out. Robyn: Intuits on the other hand have no problem embracing the unknown. This is key to their ability to create. Q: In Intuit, on the right side of the brain, everything is organic and everything’s alive, while in Reezon, things tend to look more mechanical. Robyn: That was deliberate. The Intuits live in harmony with what’s around them, because they know it’s alive. They listen to their world. They process things organically with it, not separately. They don’t like to cut branches from neurons. For them it’s like cutting someone’s arm. Whereas for the Reezons, the branch of a neuron is just an object. In a sense, these are two different ways of thinking. The Reezons think they’re at the top and that everything else is below. Stephan: But this is an illusion. The Reezons just fail to see the whole picture. Even they exist in a living environment. They’re just oblivious to it. Intuits see everything as alive and in as having some form of consciousness. In a way, it’s a bit like how we perceive our own brain. We’re alive, but we don’t often think of the cells in our brain as alive, let alone conscious. Q: How was it to write the book together? Do your brains get along? Robyn: Given that I’m more emotional and intuitive, and Stephan’s more rational and analytical, things tend to get pretty explosive. We’re both very creative, but our brains work very differently. We’re wired differently. So very often, especially when we “brainstorm”, it got crazy. Stephan: It’s not called a brain-storm for nothing. Walls get torn down. We’ve thrown things at each other. I had to patch a hole in one my walls from one of our fights. Jimmy Carter said the closest he and his wife got to a divorce was when they wrote a children’s book together. Q: Do you think that in some way, in writing the book, you lived the conflict between the two hemispheres of the brain? Stephan: If you think about it, it’s only fitting that a book about the war between the two sides of the brain, should be written by two writers. We’re like the two brain hemispheres. We’re different, but just like the two hemispheres of the brain we’re attached by a bridge, and we have to learn how to work with each other.